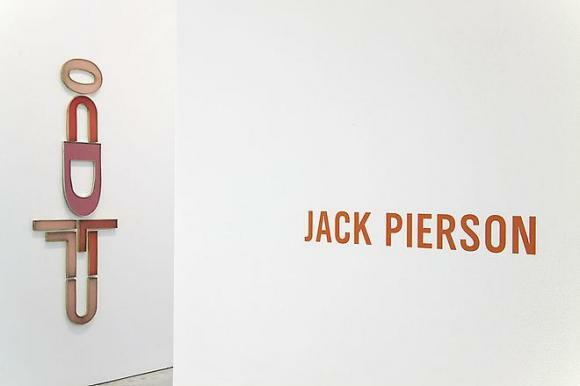 Cheim & Read is pleased to announce an exhibition of abstract sculpture by multi-media artist Jack Pierson. Pierson's last exhibition with the gallery was in 2006. Most recently, his show, "Abstracts," was on view at Centro de Arte Contemporáneo de Málaga, from June 19 to September 27, 2009. Pierson's work has long embodied sensations of nostalgia and melancholia, memory and loss. The distinctly American nature of the signage he uses references road-side ephemera and American cultural symbolism, and is imbued with poignancy and disillusionment. His work is also inherently autobiographical, balanced by a sly sense of irony and humor, which allows the viewer to identify with his imagery. In his sculptural abstractions, the emotional sensibility of Pierson's style remains, but his themes are less explicit. The work is intentionally non-objective and non-literal – a given word might still exist in a pile or hang reconfigured on the wall, but its signification is diffused. While Pierson's abstractions are inevitably related to his "readable" word-sculptures, they attempt to move beyond a singular interpretation. He questions the construction of meaning by deconstructing the viewer's search for it. The formal beauty of Pierson's abstractions is evident. Some are calligraphic, some brightly colored; some reference Minimalism, while others seem to descend from Pop. Many resemble totems, or astronomical constellations. The repositioning, re-contextualizing and recycling of Pierson's source material resets the viewer's expectations. While letters and symbols are identifiable, the composition as a whole requires a different reading, a suspension of assumption in exchange for possibility. As Pierson states: "Some are abstractions, some calligraphic, and some are cantations. The subject…is the same as the subject of all my work: hope."